The following is a guest post from Princeton University political science Ph.D. candidates Alex Bollfrass and Andrew Shaver. Natural scientists agree that the climate is changing and that humans bear some of the blame. Social scientists are now attempting to assess the economic and political price societies are likely to pay for turning up our planet’s thermostat. The security policy community is especially eager for an answer. Get the biggest election stories in your inbox. The “farmhands-to-fighters” argument linking reduced economic opportunity in agriculture to increased violent activity is consistent with other research results. Scholars at the University of California, Santa Barbara and Columbia University argue that recent drought in Syria produced “widespread crop failure and a mass migration of farming families,” resulting in in political unrest that ultimately contributed to the outbreak of civil war in the country. Research on modern-day piracy, violence in Colombia, and contemporary conflict throughout Africa is similarly consistent with this theory. It is possible to extrapolate from this research and imagine how conflict resulting from decreased agricultural employment could threaten U.S. national security interests. But changing climate trends can produce security risks in other ways. In research published Wednesday in PLOS ONE, we raise further questions about the relationship between conflict and variation in meteorological variables. Our first major finding is that warmer ambient temperatures indeed promote violent conflict in all parts of the world. The second main discovery is that heat drives violence by something more than turning farmhands into fighters. Our clearest evidence that there is more to the temperature-conflict link than disaffected farm workers is that heat and violence are correlated even in areas of the world that do not produce crops (see the two figures below). Without farms, there are no farmers who would beat their plowshares into swords. The implication is that the debate has been missing a scholarly foundation for other avenues through which climate change may threaten states’ security. One leading possibility is the well-established patterns of humans behaving more violently at higher temperatures. Another way for climate change to link to violent instability is through macroeconomic transmitters like food prices in years of lower farm production. The list of plausible alternatives is long and has received little scrutiny. To date, there is enough preliminary evidence to suggest that a real security problem may be developing. Focusing research on the drivers of this temperature-violence should be a priority for academic and government researchers. A starving sea lion pup was rescued on Thursday after it wandered into a booth in a San Diego restaurant. 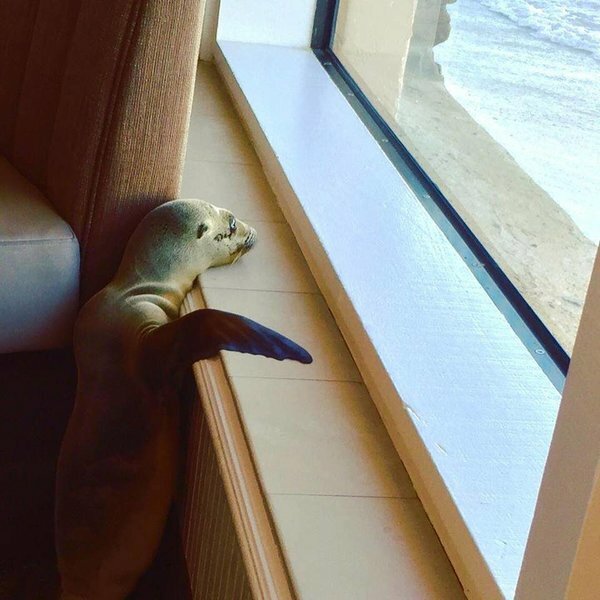 A hungry sea lion pup wandered off the beach and into a fancy seaside San Diego restaurant Thursday morning, took one of the best seats in the house and peered out the window at the waves as if preparing to order a big plate of sardines. Bernard Guillas, the executive chef at the restaurant, posted photos of the pup, curled up or looking out the window, on his Facebook page Thursday. “We found this little guy in The Marine Room restaurant this morning,” he wrote. “He was a little bit early for his high tide breakfast reservation. The pup was eventually rescued and taken to San Diego’s SeaWorld. But it was the latest reported sighting of a stranded sea lion in California, where the mammals are increasingly being found on land in places they were never meant to be, partly because of changing weather conditions driving them ashore. A sea lion wandered into La Jolla’s Cave Store, a souvenir shop, last month. An employee said she lured it outside with salmon. “It was very, very gentle,” Jim Allen, the store owner, told a local TV station. Experts are seeing a higher number of reports of stranded sea lions, particularly in San Diego through Santa Barbara Counties, according to data published by the National Oceanic and Atmospheric Administration. Many of the stranded mammals have been emaciated pups. In the first five months of 2015, there were 3,340 young sea lions found stranded, compared with 862 in the same period in 2014 and 1,262 in 2013, the agency said. El Niño, the weather condition that causes temperatures in the Pacific Ocean to become unusually warm, is believed to be a reason behind the increased strandings because of its impact on the food supply web, according to the oceanic group. It can also generate algal blooms and infectious disease outbreaks. The Marine Room, a high-end restaurant belonging to the La Jolla Beach & Tennis Club in the wealthy San Diego enclave of La Jolla, has for 75 years offered diners a view of crashing waves from its dining room built straight into the ocean. Ms. Tovar went to the room and saw the pup napping. It was not clear how it got into the dining room, leaving the china and cutlery undisrupted in table settings, and nestled into the booth. But the staff suspects it went through a back door that the cleaner had propped open to take in equipment at 6 a.m.
Ms. Tovar called SeaWorld, which sent a team with a net and roused it from sleep. The team identified it as female, about 8 months old and weighing about 20 pounds — about half the weight it should be at that age. “It was also a little bit shocking to see how small the pup was,” said Jody Westberg, one of SeaWorld’s animal coordinators, who went to the rescue. On Friday morning, the pup was getting rehydration fluids in a critical care unit in “guarded” condition. She was spending days at a pool with other pups, and the plan was to get her back to the water, Ms. Westberg said. Thursday night, after the pup left the Marine Room, dinner went on as usual in the restaurant after a thorough cleaning, Mr. Guillas, the chef, said in a telephone interview. An earlier version of this article misidentified one of the California counties where experts have noticed a rise in the number of stranded sea lions. It is Santa Barbara, not San Bernardino. Prince Charles blames the Syrian war on climate change. He has a point. Britain’s Prince Charles has blamed climate change in part for the Syrian war and warned that global warming could exacerbate similar conflicts worldwide. Charles’s comments — in an interview broadcast Monday — came exactly one week before the start of a United Nations climate change conference in Paris, where he plans to deliver a keynote address. Unless world leaders take action to slow the impact of climate change, “it’s going to get so much worse,” Charles warned in the interview with Sky News, which was recorded before the Nov. 13 terrorist attacks in Paris. Charles, a longtime environmentalist, is the latest person to blame the Syrian conflict on climate change. Various leading politicians, academics and military officials have made similar claims in recent years. O’Malley based his claim on a substantial March study published in the Proceedings of the National Academy of Sciences. The study found that the drought “had a catalytic effect with dire consequences for Syrians” — and that there is “strong evidence” that the drought was connected to climate change, lead author Colin P. Kelley wrote in a related article for the International Peace Institute at the time. The drought drove an “unprecedented rise” in Syrian food prices, leading to a “dramatic increase” in nutrition-related diseases among children in Syria’s northeastern provinces, the authors found. That led to the internal displacement of as many as 1.5 million Syrians, swelling the country’s urban centers. “The rapidly growing urban peripheries of Syria, marked by illegal settlements, overcrowding, poor infrastructure, unemployment, and crime, were neglected by the Assad government and became the heart of the developing unrest,” they contend. Models they developed suggest that severe droughts such as the one in Syria were two to three times more likely “to occur under the effects of climate change than in its absence,” Kelley wrote. Other researchers have predicted increased armed conflict in Africa driven by climate change. But these concerns aren’t limited to academics or politicians. In its 2014 Quadrennial Defense Review, the Defense Department described the effects of climate change as “threat multipliers” that could worsen the conditions that facilitate terrorism. Climate change poses another significant challenge for the United States and the world at large. As greenhouse gas emissions increase, sea levels are rising, average global temperatures are increasing, and severe weather patterns are accelerating. These changes, coupled with other global dynamics, including growing, urbanizing, more affluent populations, and substantial economic growth in India, China, Brazil, and other nations, will devastate homes, land, and infrastructure. Climate change may exacerbate water scarcity and lead to sharp increases in food costs. The pressures caused by climate change will influence resource competition while placing additional burdens on economies, societies, and governance institutions around the world. These effects are threat multipliers that will aggravate stressors abroad such as poverty, environmental degradation, political instability, and social tensions — conditions that can enable terrorist activity and other forms of violence. Then-Defense Secretary Chuck Hagel used the same phrase — “threat multiplier” — in a speech last year, warning that the glacial melt could set off a chain of events wreaking havoc worldwide. A year earlier, Navy Adm. Samuel J. Locklear III — who was the top military official monitoring threats from the likes of North Korea, along with conflicts between China and Japan — called climate change the biggest long-term security threat in the Pacific region. Climate change “is probably the most likely thing that is going to happen … that will cripple the security environment, probably more likely than the other scenarios we all often talk about,” he told the Boston Globe. An expansion of Europe’s forests towards dark green conifers has stoked global warming, according to a study on Thursday at odds with a widespread view that planting more trees helps human efforts to slow rising temperatures. Forest changes have nudged Europe’s summer temperatures up by 0.12 degree Celsius (0.2 Fahrenheit) since 1750, largely because many nations have planted conifers such as pines and spruce whose dark colour traps the sun’s heat, the scientists said. Lighter-coloured broad-leafed trees, such as oak or birch, reflect more sunlight back into space but have lost ground to fast-growing conifers, used for everything from building materials to pulp. 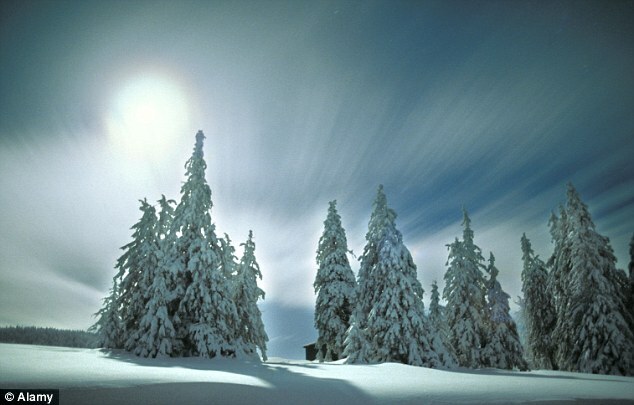 Experts say Forest changes have nudged Europe’s summer temperatures up by 0.12 degree Celsius (0.2 Fahrenheit) since 1750, largely because many nations have planted conifers such as pines and spruce (pictured) whose dark colour traps the sun’s heat. 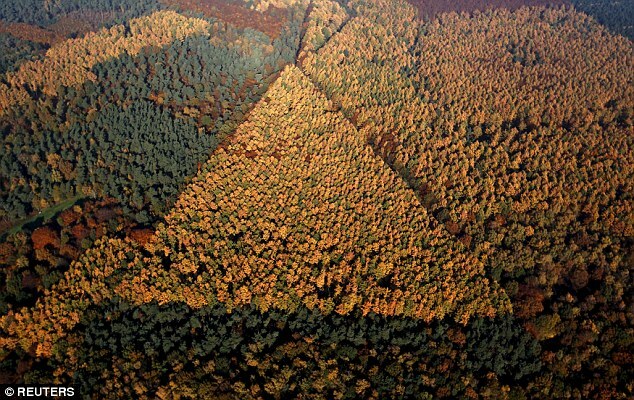 Overall, the area of Europe’s forests has expanded by 10 percent since 1750. ‘Two and a half centuries of forest management in Europe have not cooled the climate,’ the team led by France’s Laboratoire des Sciences du Climat et de l’Environnement wrote in the journal Science. They said the changes in the make-up of Europe’s forests outweighed trees’ role in curbing global warming. Trees absorb carbon dioxide, the main greenhouse gas from burning fossil fuels, from the air as they grow. ‘It’s not all about carbon,’ lead author Kim Naudts told Reuters, saying government policies to favour forests should be re-thought to take account of factors such as their colour and changes to moisture and soils. 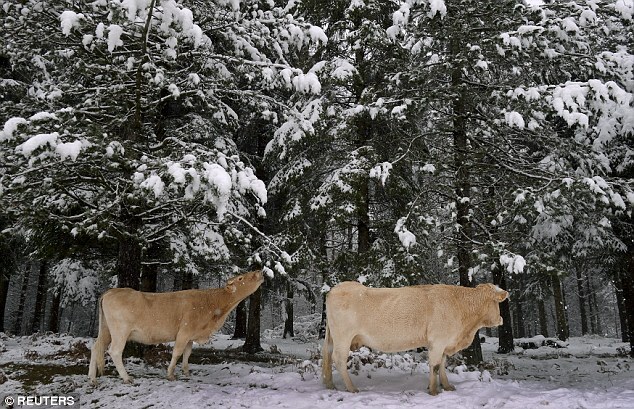 Cows eat pine needles in a snow covered forest in the Basque mountain port of Opakoa, northern Spain, in this November 23, 2015 file photo. An expansion of Europe’s forests towards dark green conifers has stoked global warming, according to a study on February 4, 2016, at odds with a widespread view that planting more trees helps human efforts to slow rising temperatures. Since 1750, Europe’s forests have gained 196,000 sq kms (76,000 sq miles) – an area bigger than Greece – to reach 2.13 million sq kms in 2010, the study said. Thursday’s study was restricted to Europe but said similar effects were likely in other parts of the world with big forest planting programmes such as China, the United States and Russia. Another study in Science, by experts at a European Commission research centre in Ispra, Italy, also linked a loss of forests worldwide to an increase in average and maximum temperatures, especially in arid and tropical regions. President Recep Tayyip Erdogan of Turkey had a more radical solution. The presence of cockroaches in his old offices, he revealed in an interview, were the reason why he needed a vast new presidential palace outside Ankara. But in an interview with A-Haber television broadcast late on Friday, Erdogan said his reasons for needing the 1,150-room palace palace were much more mundane. “A guest would come to the old prime ministry office and find cockroaches in the bathroom. That’s why we built this palace”. Erdogan’s election to the presidency in August 2014 led to a musical chairs of palaces, with him moving to the new palace and Prime Minister Ahmet Davutoglu moving to the old presidential palace in central Ankara, the Cankaya. Neither leader now uses the old prime ministry offices. The new palace has been the subject of a sometimes farcical dispute in the run-up to Sunday’s legislative elections between Erdogan and the main opposition leader Kemal Kilicdaroglu, who accused him of having golden toilet seats there.